Camping Perticara can be reached via a number of routes; below we have described the one we feel is easiest. Follow the autostrada from Milan to Bologna (A1). After Bologna, take the autostrada towards Ancona (A14), take the exit Rimini Nord. After 200 m. right towards San Leo. Follow the signs for San Leo / Montefeltro over 5 roundabouts. At the traficlights turn right towards Novafeltria /Sansepolcro. After 32 km you will get to Novafeltria. 400 m after the lights, turn right towards Perticara. Now the road starts to climb, at a slope of under 12%. After about 7 km you will get to the “top”; turn left at the crossroads towards Sant’ Agata Feltria. After 400m, turn right for Camping Perticara. Take the Rimini – Sud exit. 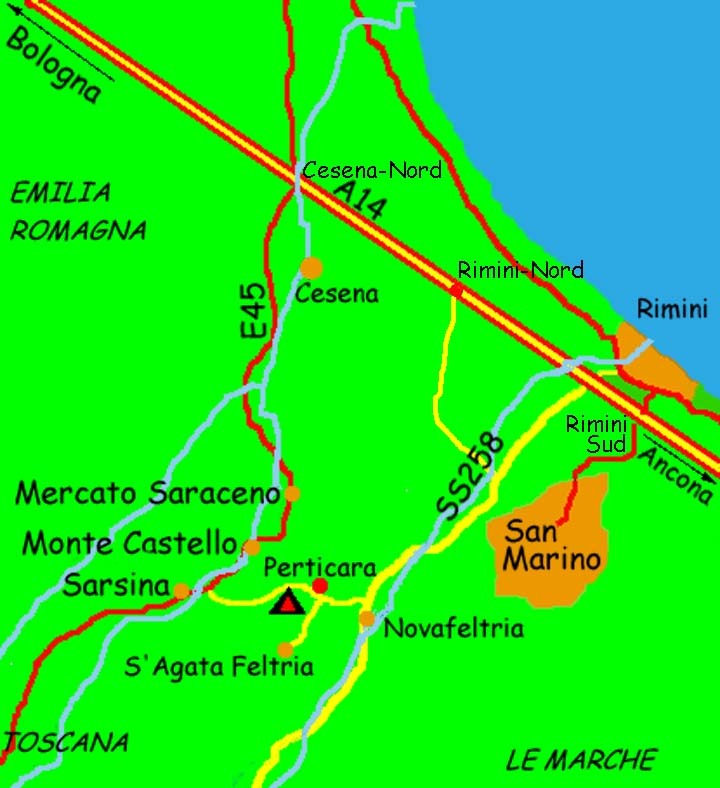 At the end of the sliproad, turn right, towards Rimini / San Leo (if you turn left you will end up in San Marino). After 800 metres, at the first traffic light, turn left towards Ravenna / Bologna. This puts you on the Ring around Rimini. After 1.7 km, take the exit for Rimini Centre / San Leo / Sansepolcro (SS 258). Go left under the viaduct (three quarters of the way round the roundabout). You are now on the SS258, which you will take as far as Novafeltria. After 32 km you will get to Novafeltria. 400 m after the lights, turn right towards Perticara. Now the road starts to climb, at a slope of under 12%. After about 7 km you will get to the “top”; turn left at the crossroads towards Sant’ Agata Feltria. After 400m, turn right for Camping Perticara.